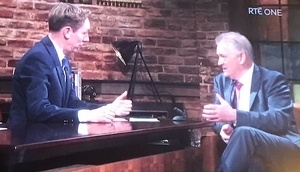 Ahead of last Friday’s Late Late Show, Ryan Tubridy teased his RTE Radio 1 viewers about the show’s guest list promising appearances by former President Mary Robinson and recent Presidential runner-up Peter Casey. 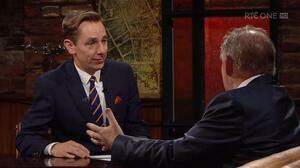 “Peter Casey, of course, [will be] joining us as well tonight. We’ve heard a lot about Peter Casey but I would argue that we haven’t seen a lot of the man who got over 300,000 votes, numbers ones don’t forget, in the Presidential election, but obviously came second. “…..A texter says ‘I’m actually I’m actually embarrassed that Peter Casey is going to be on the Late Late on the same night as Mary Robinson, the chasm between them is so huge and it is really not mannerly to have them on the same night but I love the show but seriously come on, she deserves to not have her message diluted by populism’. I understand that and appreciate the point but the nature of the show is you get all class of opinion. We would have asked Mrs Robinson on to the show a long time before we knew Peter Casey was to be such a big story which he became and what you call ignorant populism was something that resounded and resonated with over 330,000 people in this country so you cant just dismiss that out of hand either. Posted in Misc and tagged Peter Casey, Ryan Tubridy at 10:13 am on November 5, 2018 by Bodger. That’s the term used when the establsihment gets nervous. By the way, i don;t agree with a lot of what Casey says but I do believe in free speech. He admits his own ignorance. He had no idea travelers had been recognized.as an ethnic group but as soon as he was told this he was instantly against it without doing any research. Yeah and people say things like the establishment are getting nervous and invoke free speech when defending the indefensible. Wow, that’s like something you would see in Dublin. The concept of ‘freedom of speech’ , is freedom to speak against the government, not a provision to say foul things in public …..
Who gets to decide what constitutes ‘foul things’ though? Who gets to decide what constitutes “ethnicity” or “ethnic minority”? People talk about ‘rights’ all the time, and how *they* have ‘rights’ and *they* should be allowed to exercise their ‘rights’ however they want. But often they seem to forget that other people have rights too, and sometimes your ‘rights’ infringe on my ‘rights’ (and vice versa). – You have the ‘right’ to your good name. – I have a ‘right’ to free speech. But if I exercise my rights and say something libellous about you – I am infringing on your rights to a good name. So none of these ‘right’s are absolute. I’m glad to see Broadsheet has become the defender of poor put-upon Peter Casey. All Peter wants to do is help his country (well close enough) by created a mass internment camp for Travelers out of spite for the man who comprehensively beat him in a fair election. Where did he ever say that? Regardless of whether you agree or disagree with Casey, it kind of seems an impolite way to talk about someone whom you have invited on as a guest on your show. or rather who your producer forced you to have on your show. Ryan Tubridy is professional broadcaster, who should be able to interview people whom he does like, and whom he does not like, in a professional manner; he is paid enough money for it. How was Ryan impolite (in the quote from the radio) above? He defends the decision to have Peter on the show (albeit based more on the 330,000 people that voted for him – rather than Peter himself). He didn’t use the phrase ‘ignorant populism’ , the texter did. thanks BB – I had missed that. Hmmm…. Is Peter Casey the new GO’D? 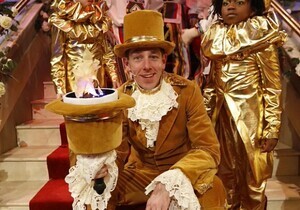 Why is it so easy to imagine that Tubridy inserted the line “but I love the show”, himself, even if he didn’t. Both he and Casey are loathsome. I would rather shoot myself, than stay in and watch ” I read ” Tubs on a Friday evening. He is only capable of reading out the questions prepared for him by the RTE intern and is incapable of holding a conversation , let alone a debate. It is not much of a stretch of the imagination to suggest that that his incessant natter about books is to compensate for his terminally shallow self. Casey made a very good point about a halting site in the Phoenix park. Why isn’t there one? and if RTE are so bothered about a set upon minority why can’t they have a nice halting site at Montrose? What has that got to do with halting sites? Surely that would be something for Michael D to be proud of? Use his expenses to educate the most marginalised etc. It is not like it would be the whole park or anything, just a small part of the Aras an Uachtaráin grounds. Run with Casey’s idea and neutralise the media bullpoo in one public statement. Why not? He is a socialist after all… allegedly. Radie Peat singing even? Sorry to burst your bubble people but Higgins and Casey are politically a lot closer to each other then you would like to imagine. All Casey really said was that travellers could do with the opportunity to avail of a proper education. He said that after he lost the election. Ridiculous idea all the same. The Park is a conservation area and a tourist attraction – not the place for rubbish, horses and caravans. Not a place for the likes of travellers. Where is this fake outrage coming from. Casey spoke facts, 100% facts. I have never met anyone who would be happy having travellers living in the area, never mind beside them.